Aldonal-H is supplementary feed for animals including horses, pigs and sheep. The powder supports animals suffering from digestive disorders. It can be dissolved in lukewarm water. 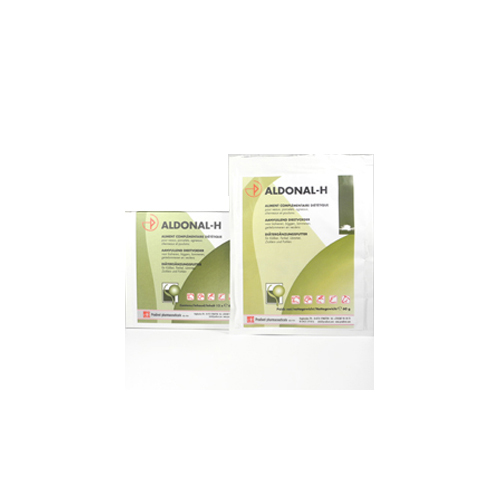 When your horse, pig, sheep, goat or cow is suffering from digestive disorders you can give it Aldonal-H. This supplementary animal feed supports the protection of the intestinal mucosa and the equilibration of the water and electrolytes balance and offers a source of energy. Aldonal-H also contains sodium, potassium, magnesium, calcium and chloride. These minerals are a source of important nutrients for your animal. One pouch of Aldonal-H can be dissolved in 1.5 litres of lukewarm water. Give up to two to four pouches a day. This dosage can be followed for three to four days. Please note: Always consult your vet before use. One box contains twelve 60 gram pouches. Dextrose, monohydrate, sodium chloride, potassium chloride, monopotassium phosphate, asbestos free kaolinite containing clay, calcium D pantothenate, riboflavin, thiamine mononitrate, pyridoxine hydrochloride, sodium, potassium, chloride, lysine and magnesium. Have you used Aldonal-H before? Let us know what you think about this product.